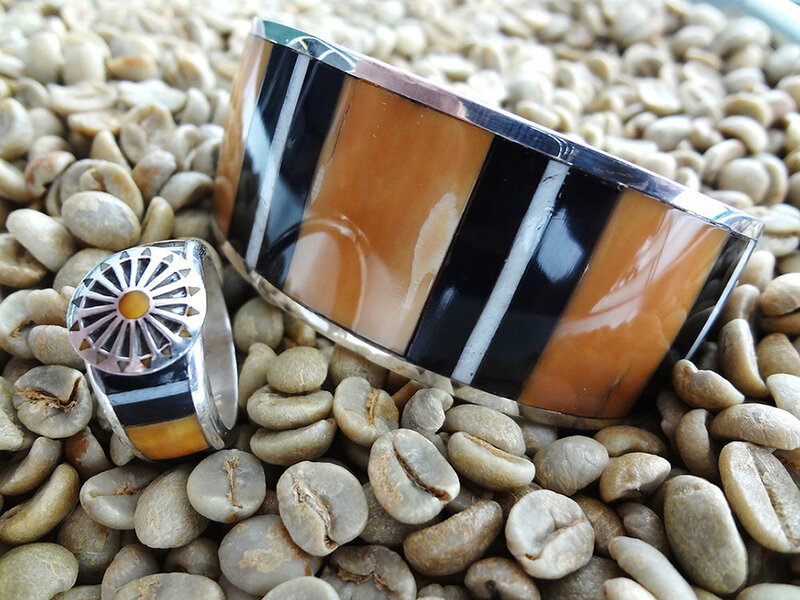 Brian Szabo is a Sicangu Lakota artist who creates contemporary jewelry with traditional motifs. He and his family of five live in La Crosse, Wisconsin. A perpetual learner of his craft, culture and heritage, Brian Szabo puts that knowledge to use as he creates jewelry and knives made with traditional materials. He grew up watching and working alongside his father, an accomplished silversmith, who helped guide his work. Brian learned the art of using natural and traditional elements, and how to apply a contemporary twist while working with buffalo, elk, deer, antelope bone, horn and antler, turquoise, lapis, black onyx (beads), fossilized ivory, silver, wood, carnelian and red pipestone, which is an important material to the Lakota. Brian learned to apply what he knows through his work while balancing the critical things in life — caring for and showing respect to family and friends; giving his time and knowledge to others; and taking pride in his culture and history. In Wisconsin, he welcomes questions from the many people interested in Lakota culture. He does his best to educate them and continues to learn more himself so he can become a strong voice for his people. To become a leader for Native arts. Balancing full-time art with his full-time job of being a stay-at-home father brings tradition, creativity and raising a family together for a fulfilling experience. His wife, Angie, splits her time between teaching middle school art, being a mom and fitting her own pursuit of art into the mix. They’ve supported one another’s art since they met and fell in love on the Rosebud Reservation when Angie came to teach art at the middle school. Though Brian’s work has put him on the Earth, Wood and Fire tour and garnered top awards and recognitions at the Eiteljorg Indian Market, Northern Plains Indian Art Market, and Native POP, he’s still learning. He’s developing stronger confidence in his ability as a businessperson through his First Peoples Fund program. He wants to carry on what his father taught him with the hope to share what he’s learned with future generations.